Since Edgeless is getting tons of questions from the community in all the different channels, the team have decided to start a monthly FAQ to answer all the “hot” topics at once! Edgeless is talking with several exchanges at the moment. However, the team is very happy for all the help and support that it gets from the community regarding this area. Edgeless always check the ones the community asks for the most and try to get more markets/pairs for the investors to trade in. Due to legal questions, Edgeless could not reveal the names of the exchanges but the team are working to bring you some positive news in this area. Edgeless marketing/communication team is growing so, what everyone was expecting for some time is coming. Edgeless display ads are already on 10 000 channels but even more are coming, in order to increase the presence of Edgeless and attract all the new users. Edgeless is also going to be covered by influencers on Youtube and PR articles on media platforms. More than 200 channels have already been contacted, marketing team is working on the highest quality content and localization opportunities. The presence on the little forgotten platforms such as reddit and bitcointalk are coming back, since these channels have a huge amount of users. So, feel welcome to comment, write and discuss with us there. At the same time, Facebook is going to be used for communication with players - so, new communication strategy is on the way - new types of information and all the updates that are important for the players. While Q1 was quite exciting with the releases of 1.0 version and Dice, Q2 is going to offer plenty of good additions. However, the biggest focus is for scalability of the back-end to make games considerably faster; for bugs fixing, to create an enjoyable customer experience for every bet; and new players attraction, what is clearly understandable. To add up, Edgeless is also going to be participating in several conferences - Cyprus Gaming Show 2018, Vienna Gaming Expo 2018 and World Gaming Executive Summit 2018. Bug Hunting program will be available for anyone, who is qualified or lucky enough to find a bug and according to the risk and importance of the bug, the hunter will get a reward as a little thank you notice from the team. Edgeless Casino goal is to get the licenses from UK and Malta. Both of the jurisdictions would be relevant to the growth of the project. Despite this, Edgeless is planning to have more than one license to have a stronger position in legal framework of the casino industry. Therefore, the documentation from the legal side is already in process. Fairness check will be open this week! The new system will let you to write the seeds of any game you had and see the outcome of the game. You just need to put server seed, your seed and the game answer will be shown… This way, you could check that no matter of the size of the bet or any other circumstances, the RNG wasn’t faked. This feature should bring trust and clearance in the platform. The full statistics will be opened with the update of the platform that Edgeless will have this quarter. However, the team have already launched a little part of live statistics of your own game. 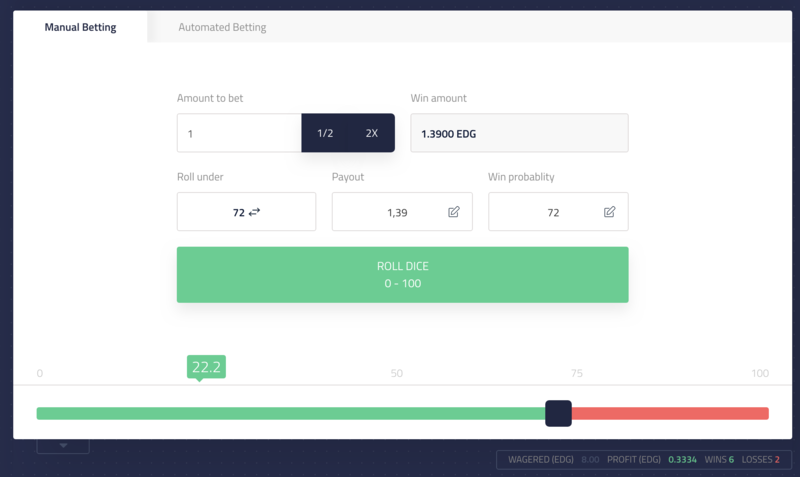 This will count your game statistics of all the games since you log in to the platform till you log out, so you see the “Wagered (EDG); Profit (EDG); Wins; Losses) live! 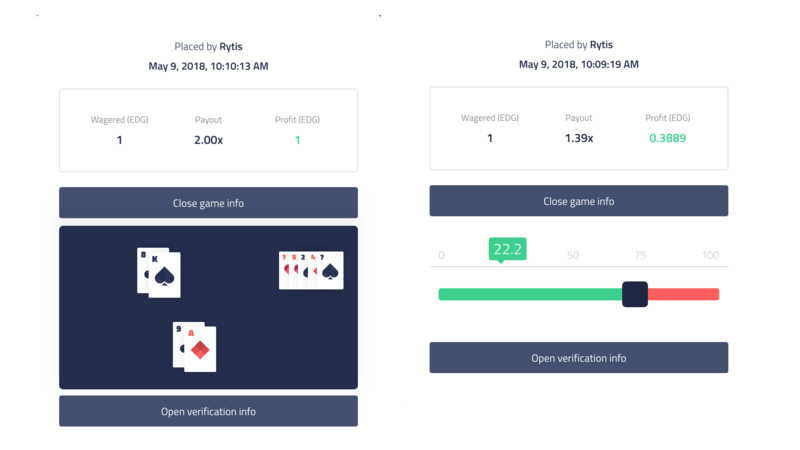 Since bankroll staking is one of the “hottest” topics among the community, Edgeless wants to clear this up once more. Edgeless is still testing the whole concept and the system of bankroll staking since it will include a huge amount of the EDG tokens, and to ensure the safety this process should be impeccable. The team truly believes, that every investor is concerned about the safety and every single person of the community understands why the team needs to check it so extensively and why it takes some time. Therefore, it is not going to be open till the whole process is done and is it safe to do so. Many thanks for your ongoing support and hopefully this has helped.